Making myself a cup of coffee is one of the first things I do when I wake up in the morning. It is a must-have for me. Besides the fact that it helps get me going for the day ahead, I also enjoy the taste. Even after all these years of being a daily coffee drinker, I still look forward to that first sip every morning. Pure bliss! I’m always open to experiment and I thrive on trying new recipes and discovering different ways to enjoy my favourite beverage. In the summer months, I’m also looking for ways to beat the heat. Coffee, I love you, but when it’s 33°C, I want something cold to drink. 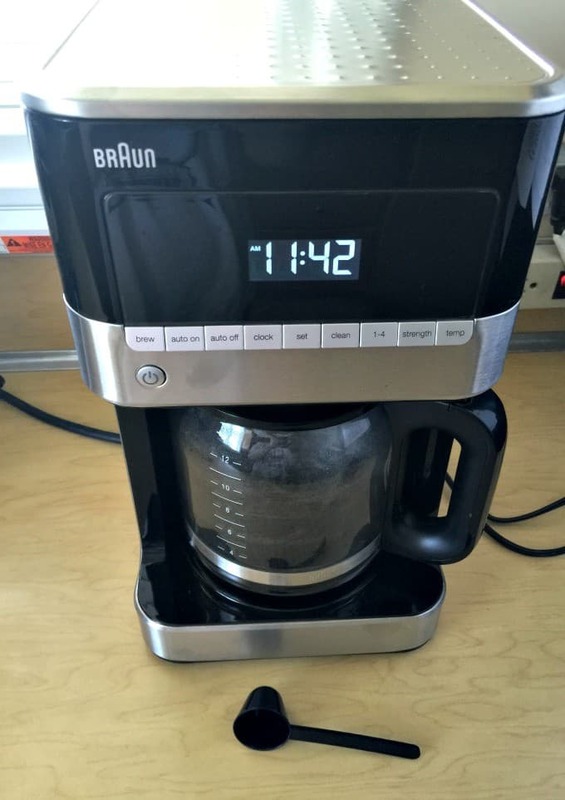 Recently, I’ve been experimenting with my new Braun BrewSense Drip Coffee Maker and Braun PureMix Blender to create a new, delicious and COLD coffee drink perfect for the summer heat. It’s a sophisticated revamp of my Caramel Coffee Milkshake recipe. 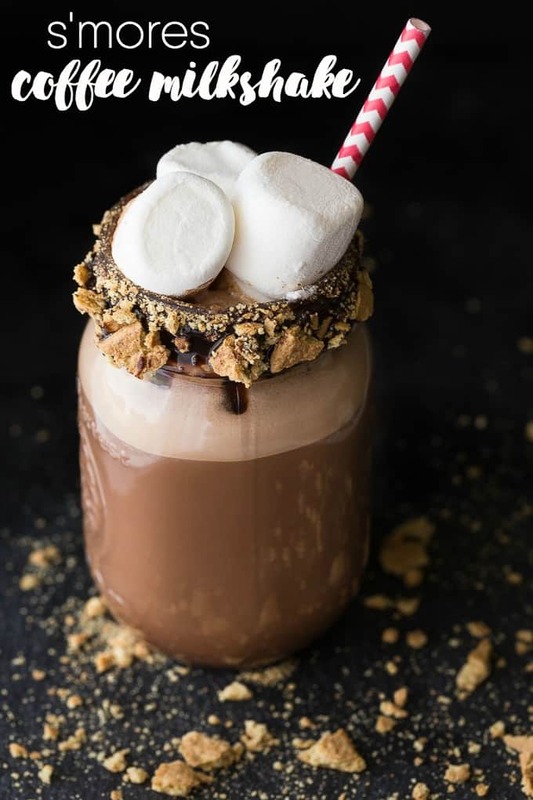 Meet the S’mores Coffee Milkshake. It takes drinking coffee to a whole new decadent level! Like my previous coffee milkshake recipe, it uses freshly brewed coffee and ice cream. I took the recipe up a notch by adding a few ingredients in everyone’s favourite campfire treat, s’mores. It’s made with chocolate ice cream, black coffee, marshmallow creme and chocolate syrup. You can’t have s’mores without graham crackers so I rimmed the glass with chocolate and crumbled graham crackers. It’s finished off with big fluffy marshmallows. It tastes even better than it looks. Rich, creamy, sweet and cold, what’s not to love? We had company over to visit and I asked them if they wanted a cool drink. You should have seen their faces when I brought out a tray of S’mores Coffee Milkshakes. Their expressions were a mixture of shock and delight! Check out my video to watch this recipe come to life. What they didn’t realize is how easy this recipe was to put together. My new Braun appliances did most of the hard work for me. If you haven’t heard the news, Braun is BACK after 8 years! Their new household line of products are now available in North America. Not only do they look fabulous in your kitchen, but they also work just as well as they look. Food preparation and making coffee is a breeze. Braun conducted a huge amount of research to find out what home cooks like us wanted and needed in their kitchen. They used this knowledge to build products to fit our needs and help make our lives easier in the kitchen. 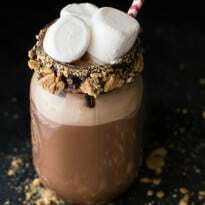 For this S’mores Coffee Milkshake recipe, I prepared the coffee in my Braun BrewSense Drip Coffee Maker. One of my favourite features is the PureFlavor Brewing System that ensures your coffee tastes delicious right to the last drop in the pot. I love the “Keep Warm Plate” feature so my coffee stays nice and hot for hours. My Braun PureMix Blender works its magic to make this recipe come together beautifully. It has five speed modes plus an auto pulse function. I used the Liquify mode for this recipe. The ingredients were completely blended within 30 seconds and ready to serve. 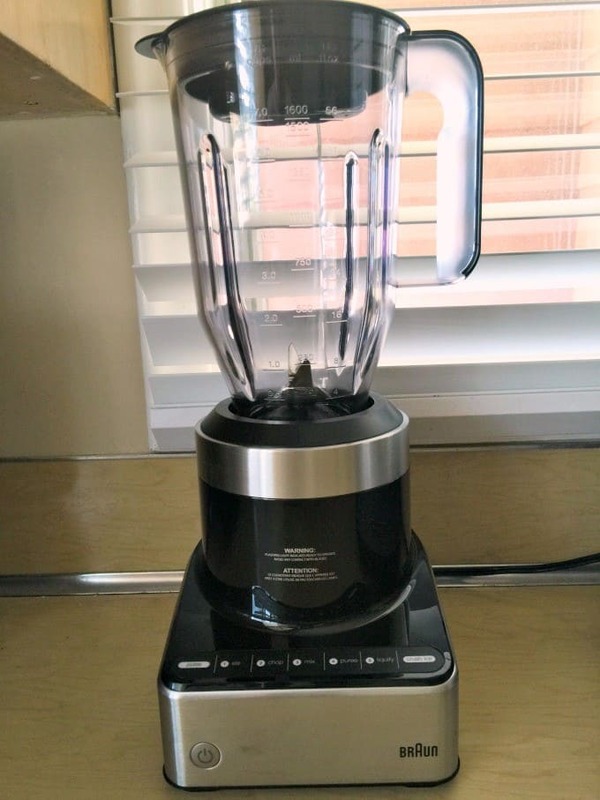 It has PowerAssist technology so the blender senses what’s inside and maintains optimal speed to ensure all the ingredients come out perfectly. 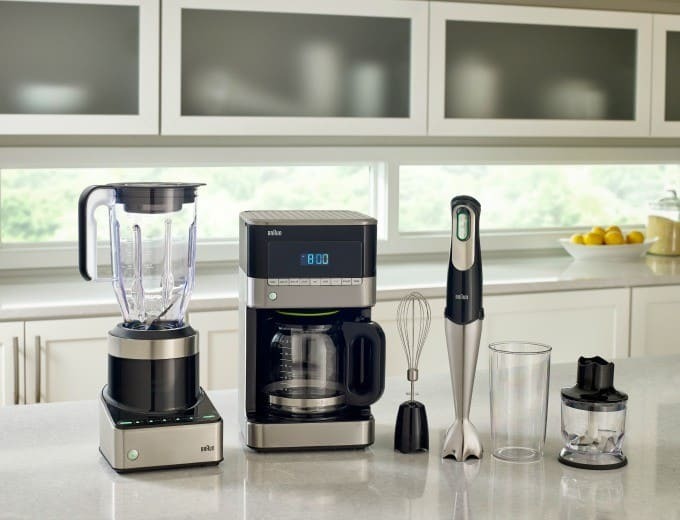 Visit Braun to learn more about their new kitchen collection including the Braun BrewSense Drip Coffee Maker, Braun PureMix Blender and Braun Multiquick 7 Hand Blender Set. Get ready to conquer the unexpected in your kitchen too! Rich, creamy and perfectly sweet! You’ll love this delicious summer drink to help you beat the heat. Pour 1/4 cup chocolate sauce in a bowl. Turn two glasses upside in the chocolate sauce, moving it around to rim the glass. In a another bowl, place the broken up graham crackers. Dip each chocolate-rimmed glass in. Carefully pour into your glasses. 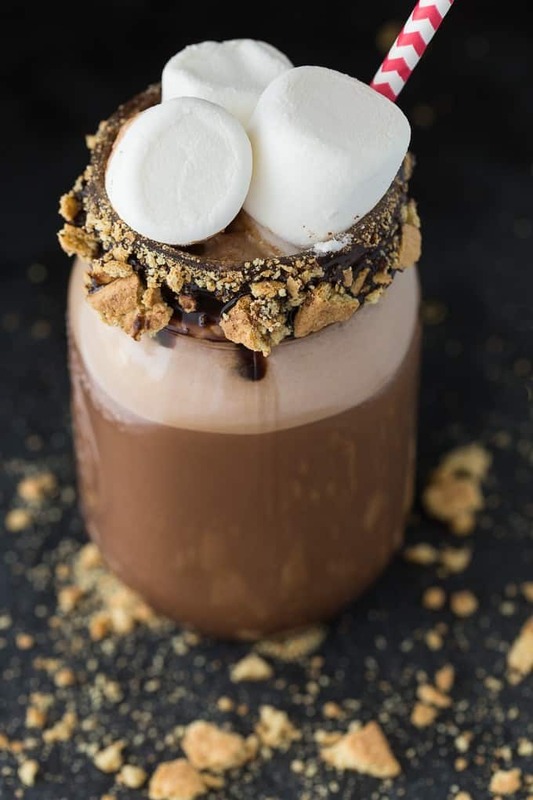 Top with three marshmallows and serve. * I used the Liquify setting on my Braun PureMix Blender. Yum! Looks and sounds really good, never really thought about using coffee in a milkshake so I am going to haveto try this out. I am going to try this on holidays next week and going to add Kahlua & Bailey’s , thanks for the post! Oh my gosh, this looks incredible!! I can’t wait to give this a try! I am completely addicted to anything s’more! Thanks for sharing the recipe! This looks so good, I’m going to have to give it a try, but mine won’t look as good as yours!! This looks so good, and perfect for summer! Beautiful picture! This looks delicious and perfect for a hot summer evening! Well doesn’t this sound completely amazing?! YUM! Lord, have mercy. If I’ve ever needed anything more in my life than this RIGHT NOW, I can’t think what it was. And as luck, would have it, I just got a new blender. This cannot be mere coincidence. 😉 So glad I found you at Full Plate Thursday! This is one of those recipes that you can’t not click on! Looks heavenly! 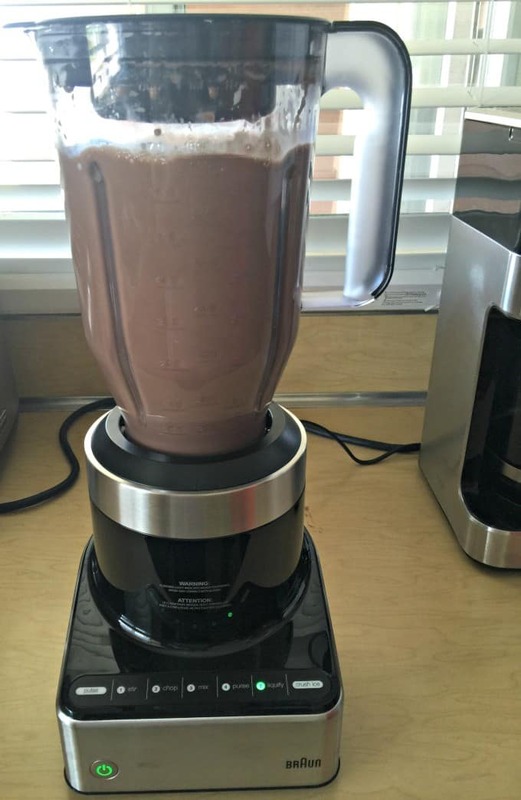 I think I need one of those blenders…. I can see the addictive nature of this recipe! Amazing! Oh my goodness this is like a fabulous dessert! Thanks so much for sharing with us at Full Plate Thursday and have a fabulous 4th! I love coffee. As a matter of fact, I’m on my way to get a cup of something coffee inspired right now. Your recipe looks tasty and indulgent. Yum! This sounds like the perfect milkshake for around the fire! Oh my goodness this looks amazing and the coffee sounds so good in it! Can’t wait to try it! This looks amazing! I love anything cold and containing coffee; this sounds like a perfect summertime treat. Thanks for linking up with Merry Monday! Wow, looks amazing., combining three of my favorite flavors, chocolate, coffee and ice cream!! Thanks for sharing with Small Victories Sunday Linkup. Pinned to our linkup board. Oh my word! This sounds amazing! Thanks for sharing at #SmallVictories linkup!